Have you ever found a squirrel trying to get into your bird feeders or vegetable garden? Have you ever tried keeping the chipmunks out of your trash cans? If you’ve attempted to get rid of them, you’ve likely discovered that they run away from you quickly. When they do run away, you’ll have to find a solution to keep them out of your bird feeders and gardens indefinitely. If you’re wondering how to keep the squirrels away, have you thought about making a homemade squirrel repellent to deter them? When dealing with animals like squirrels, you’ll want to avoid using chemical-based products, as they contain chemicals and pesticides have the potential to harm chipmunks. Therefore you should use natural recipes to shoo them away. Learn how to create your natural squirrel repellent with our tips and tricks. Learning how to make homemade squirrel repellent can be a challenging task, especially if you don’t have the proper ingredients. Luckily, this pepper spray squirrel deterrent will do the trick. Boil the water and add all ingredients to the pot. Stir the mixture for approximately thirty minutes. Turn off the stove and let the liquid cool. Once the combination is at room temperature, strain it so that the vegetables are separated and pour the liquid into a spray bottle. Spray the hot pepper spray on and around surfaces you’d like the squirrels to stay away. Powdered squirrel deterrents can be useful, especially in hard to reach places. These types of DIY squirrel repellents are also the best solution to ensuring chipmunks stay away from your bird feeders. Mix equal parts of each spice and sprinkle the flakes in areas you want to keep out the squirrels. We suggest you mix the repellent with your bird seed. Doing this will prevent the squirrels from eating the food, as they do not like anything that tastes spicy. Sprinkling spices over the bird food does not harm the birds in any way; in fact, birds do not have taste buds that transmit heat. The powder-like repellent will only add flavor to their sunflower seeds, safflower seeds, or other sources of food to help them taste better. Squirrels start to prepare for winter hibernation during the fall season, which means that you need to get on top of your pest control home remedies during the late summer months. Chipmunks usually search for bulbs and other seeds in your garden when they’re in preparation mode, which means you’ll have to break out a good squirrel repellent recipe. Mix a few drops of detergent or dish soap with a few tablespoons of cayenne pepper. Once you’ve maintained a right fluid consistency, pour the mixture around areas to keep squirrels away. Squirrels enjoy eating at bird feeders just as much as the birds do, and it’s not so easy to find squirrel-proof bird feeders to purchase. Instead, place the bird feeder that you already own on a tall metal pole. Use cooking grease, like Crisco, to coat the pole. If you lather on the right amount of oil, squirrels will have a hard time climbing up the pole to get to the bird seed. They’ll likely slip down the pole with the greasy like substance all over their feet. Because the active ingredient in cooking grease is difficult to remove from their feet, they will not attempt to climb the Crisco lathered pole again. Though this is an excellent trick to keeping squirrels away from bird feeders, keep in mind that, if ingested, cooking oils can harm cats and dogs. Be careful of where you apply it. Squirrels have a sensitivity towards spices, therefore using ingredients like hot sauce in deterrent recipes will guarantee they will flee. Combine all ingredients into a spray bottle and shake gently. Spray the mixture in crawl spaces, on garden patches, and anywhere else you’d like to deter squirrels. This mixture will not hurt squirrels; it will just get them away from the areas you spray. You don’t want the squirrels to start treating your bird feeders like their home, and we understand that. If they begin to do this, it’s time to make a homemade squirrel baffle. Go to your local supply store and purchase a deep plastic bowl. Cut the lip off of the container to make it difficult for squirrels to grab and cut a hole in the middle of the container. Make sure that the gap matches that on the bird feeder pole. Cut down one side of the bowl to the center and drill holes along each side of the cut. Finally, spread the cut side and twist it over the feeder pole. Lock the baffle into place using bolts, screws, and L-brackets. Deterring squirrels is easy, especially if you have mothballs handy. Place mothballs around your garden or flower pots if you want the squirrels to stay out. Be sure to keep these away from pets and children, as they can be very harmful if ingested. In this squirrel repellent article, you’ve discovered how to create a DIY squirrel deterrent using ingredients from around the house like a gallon of water, cayenne pepper, hot sauce, and dish soap. Getting squirrels away from your bird feeders, garden, and flowers are now more accessible than ever before. 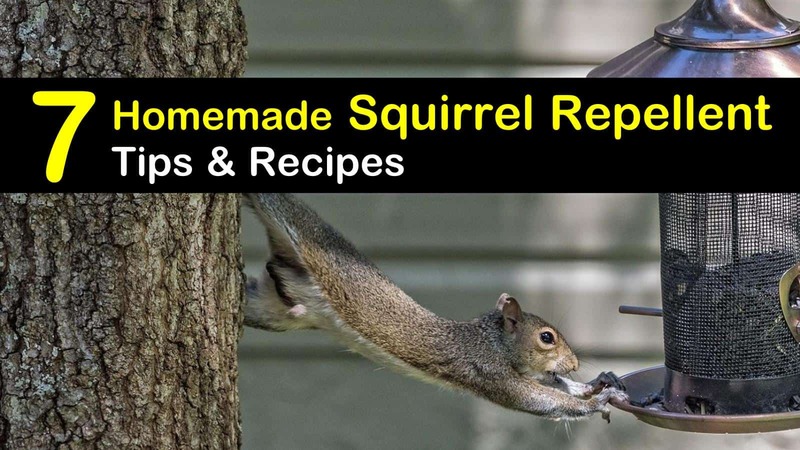 We hope you liked our tips and tricks for creating a great homemade squirrel repellent. 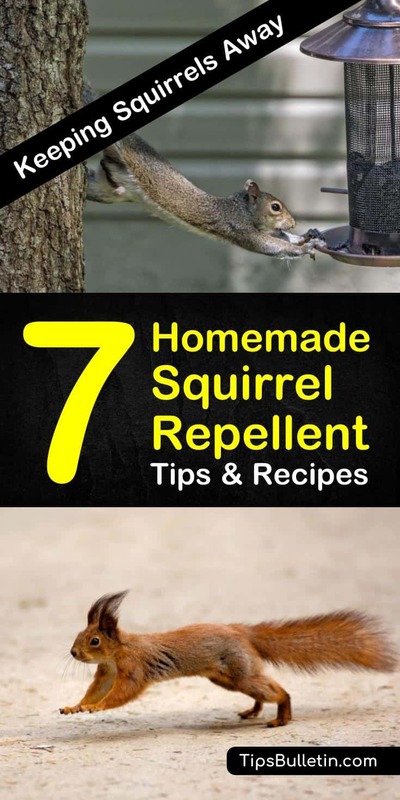 If you enjoyed our natural squirrel repellent recipes, please share them on Facebook and Pinterest with your family and friends.